Nutrition Response Testing is very precise and scientific. However, if we were to analyze you using Nutrition Response Testing before it was explained to you, you might find it strange, or simply not believable – only because it is probably very different from anything you have used or experienced. If you want restored health and longevity for yourself and your patients, it is important that you understand what Nutrition Response Testing is and what our recommendations are based on. Otherwise, you are less likely to comply with your own program and your patients won’t experience the amazing benefits that are routinely attainable. The only reason we are here is to train clinical masters who get excellent results on 90% or more of cases and become known as healers in their community. We have no other reason for being here. That is why I want to make sure you get the correct understanding of what Nutrition Response Testing is, right from the start. In medical practice there are two key parts: the diagnosis (identifying and/or naming the “disease” or syndrome) and the treatment (drugs, surgery, etc.). In Nutrition Response Testing we do not diagnose or treat disease—but we also have two parts: the analysis (the assessment of your body’s current health status) and the personalized health improvement program (using designed clinical nutrition). 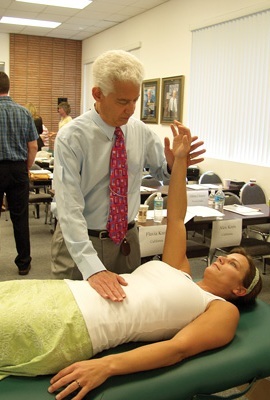 The analysis is done through testing the body’s autonomic nervous system. Instead of connecting electrodes to the areas being tested, as in an EKG, the Nutrition Response Testing practitioner contacts these areas with his/her own hand. With the other hand, he/she will test the muscle of your extended arm. If the organ/area being contacted is “active” the nervous system will respond by reducing energy to the extended arm, and the arm will weaken and drop. This drop signifies underlying stress or dysfunction, which can be affecting your health. Second, the Personalized Health Improvement Program. Our decades of clinical experience tell us that when we have found the correct nutritional supplements, as indicated by this procedure, and have worked out a highly personalized nutritional supplement schedule, we have identified the most important first step in correcting the underlying deficiency or imbalance that caused the organ/area to be active in the first place. By following the program as precisely as possible, you are well on your way to restoring normal function and improving your health. It’s that simple! In medicine, the medical doctor makes a diagnosis and then uses drugs or surgery to attack or suppress the symptom, or to surgically remove the “offending” organ or malfunctioning part. In Nutrition Response Testing we use designed clinical nutrition to correct the cause of the problem, so that the body can regain the ability to correct itself. In most cases it is concentrated whole food, in a tablet, capsule or powder, prepared using a unique manufacturing process that preserves all of the active enzymes and vital components that make it work as Nature intended. These real food supplements have been designed to match the needs of the body, as determined by the positive response shown when tested against the active Nutrition Response Testing organs/areas that were found on your individual Nutrition Response Testing analysis. These are nutrients you are simply not getting, or not assimilating, in your current diet. Over-the-counter vitamins are pharmaceutically engineered chemical fractions of vitamin structures reproduced in a laboratory. These cannot be used in lieu of whole food supplements in a designed clinical nutrition program. The label “natural” is misleading when applied to nutritional products, as the FDA will approve such labeling based on a small percentage naturally sourced components. Such products don’t correct existing imbalances and may introduce new ones. Your vitality and energy is derived from live food. Most foods available today are dead, or are not really foods at all: boxed cereals, canned vegetables, soda pop, etc. You can readily understand the difference between dead, devitalized pseudo-foods, with the synthetic or isolated vitamins on the one hand, and “Designed Clinical Nutrition” and a diet of real foods, on the other. So-called “scientific research,” done with these shoddy substitutes, repeatedly “proves” that vitamins don’t do much good for anyone! Can you imagine who pays for these “studies”? 1. Through an analysis of your body’s organs/areas, we help you to determine the exact nutrients you need to supplement your diet, in order to bring about balance and better health. 3. Depending on your individual situation, we might also require that you make some specific changes in your diet and eating habits, and in your routines, in order to bring about the best possible results.